Extension Description: With this extension you can set a Topic Template (text) in the ACP for each forum in your board. The editor gets prefilled with the text that you defined in ACP whenever someone starts a topic. This is an upgrade and rewrite of my "Posting Template" extension. It got renamed to "Topic Template" to reflect better what it does. 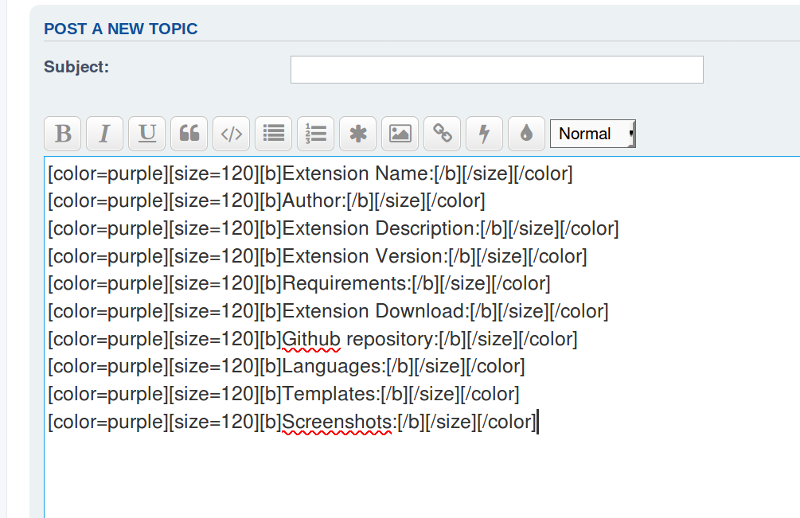 The "Topic Template" extension checks in the install process if the "Posting Template" extension is enabled. If this is the case, all template data is copied to the "Topic Template" extension. Install and enable this extension. Last edited by martti on Wed Apr 25, 2018 5:23 am, edited 2 times in total. It was nice but no adjustable content in acp. Now I can set everything individually for each forum. Last edited by jan_2017 on Sat May 19, 2018 5:28 pm, edited 1 time in total. Currently I use phpbb3.2.2 and could use an topic template extension, so I created a folder named marttiphpbb and an subfolder named topictemplate. In the subfolder I copied all unpacked files and finally found the extension in the admin extension manager. Assumption causes many times lots of trouble. Still my guess is that you are not using PHP7+. Did you check with phpinfo() (ACP > PHP Information) ? I misread, therefor I copied it from acp. Do you know of an older extension version that does actually support the 5.6 php for phpbb3.2.2 version? Last edited by php-bb3-user on Thu May 24, 2018 7:41 am, edited 1 time in total. ~dotdeb+7.1 is the build for Debian 7.1. Which is from June 2013. My previous extension "Posting Template". So Later on, when php 5.6 has been upgraded, an conversion can be done, correct? That's right. It's described in the first post here.